Self-adhesive notes, also called "sticky notes," are partially adhesive, detachable note papers that have revolutionized memo making. Throughout the country, it seems almost every surface in an office is amenable to the little yellow notes: they're stuck to desks, computers, files, folders, and rolodexes. Home is not off bounds either; the notes appear frequently on cabinet doors, telephones, and refrigerators. The tremendous appeal of sticky notes is in part because they are so easy and convenient to use. They can be placed exactly where you want them without any fasteners like tacks, paper clips, or staples. They are also reliable; they do not easily float away, nor do they leave glue stains or dents like paper clips do. As pervasive as sticky notes are, they are a newcomer in the office supply market. The creators of the notes, Minnesota Mining & Manufacturing Company (3M), first distributed their well-known Post-it brand nationally in 1980. Four years later, it was the company's best-selling product. A decade later, sales of Post-it notes exceeded $100 million. By 1995, industry analysts estimated a sales of $500 million, one of the five best-selling office products in the world, along with Scotch tape, liquid paper, copy paper, and file holders. 3M still dominated the market well into the 1990s, keeping a tight rein on the company secret to making the unique note pads. Sticky notes were a long time in the making, involving many people and obstacles. Ten years passed between the discovery of the adhesive and its application. During the mid-1960s, the 3M company was conducting a four-year program dubbed "Polymers for Adhesives." Spencer Silver, one of the participating chemists, became interested in a new family of polymers developed by Archer Daniels Midland, Inc. (ADM). Silver acquired the ADM monomers and performed an experiment in which he mixed an unusually large quantity of the element with the reaction mixture, totally contrary to established scientific principles. Ordinarily, this process, called polymerization catalysis, required mixing very precise ratios of the elements. By defying scientific rationale, Silver discovered a totally unique phenomenon—a new polymer that was only partly sticky, not "aggressively" adhesive. This polymer would ultimately serve as the "tack" between the sticky note paper and other surfaces, holding them together but allowing easy separation without damaging either surface. Significantly, the polymer was also scientifically reliable, that is, the combination would always lead to the same result. Silver was fascinated by his discovery and investigated potential applications for it, but to no avail. The first product that Silver conceived was a sticky bulletin board that was covered with the adhesive. hymnal. It occurred to him how convenient it would be to have a "permanently temporary" bookmark that would stick to the page, but could be removed without harming it. 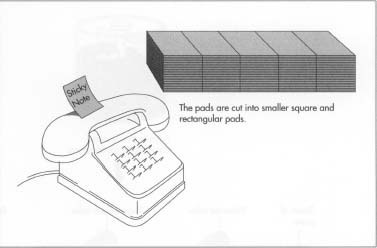 The sticky notes would have to have several properties: they would have to be moderately sticky on part of the back side, not sticky on the front, and they would have to be stacked into pads. One problem facing the researchers and engineers was that the polymer molecules tended to stick more to themselves than other objects. Thus, if two objects were joined by the adhesive and then separated, the glue would come off unevenly from the surfaces. The polymer required a substrate onto which it could adhere well. To address this problem, Henry Courtney and Roger Merril created a method of priming the substrate on the back of the paper, so that the glue would permanently stick to that surface. "Once people started using them it was like handing them marijuana. Once you start it, you can't stop." In 1977, the first formal test markets for the note pads in Denver, Tulsa, Tampa, and Richmond were complete failures. The notes were a new concept and people simply did not know how to use the pads. The whole project was almost scrapped. Some people in the company, however, believed that the problem could be solved with personal demonstrations. They concentrated their efforts in Boise in 1978, with heavy advertising and lots of demonstrations. It worked, and orders came in immediately. The following year, 3M changed the name from Press'n'Peel to Post-it notes. In 1980 Post-it notes went into national distribution, and four years later, the tear-off pads became 3M's most successful new product. A few years later, the note pads were developed in a variety of colors, sizes, and styles, including preprinted notes with headings such as "copy," "rush," and "FYI." Competitors inevitably began to market versions of the sticky notes as its popularity grew. The basic element in the self-adhesive note is, of course, paper. Yellow is the standard color, although assorted color pads are also available. The key ingredient is the unique polymer adhesive which makes the note pads "temporarily sticky" so they may be removed from a surface and reused. A machine applies the adhesive, stacks the paper, and cuts the paper pads to the specific sizes. 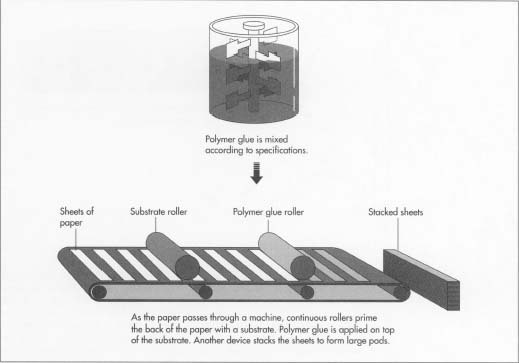 1 The polymer-based adhesive is mixed and placed into the machine which applies the glue to the paper. 2 For preprinted pads, the memo headings are printed onto large sheets of paper. The paper is placed into the machine and prepared to be fed through the priming device. 3 As the paper passes through the machine, continuous rollers prime the back side of the paper with a substrate. Next, the polymer glue is applied on top of the substrate. 4 As the paper passes from the glue application, another device stacks the sheets of paper on top of each other to form large pads. Attached to the bottom of the pad is a piece of paper listing the company and brand names. 5 The pads are cut into smaller square and rectangular pads in the standard sizes, ranging from the smaller 1.5 by 2.0 inches (3.8 by 5.1 cm) to 8.5 by 11 (22 by 28 cm). 6 The pads are labeled with the product name and manufacturer and wrapped in plastic. The pads are packaged together in bulk into larger boxes and shipped to distributors and wholesalers. The future of sticky notes in the U.S. looks highly promising beyond the 1990s because of the product's usefulness in the office as well as at home. Although competitors began entering the market, 3M still dominated the category it had created. 3M also applied their polymer adhesive to more than 300 new applications, ranging from medical bandages to reusable interior-decorating kits. Gershman, Michael. Getting It Right the Second Time. Addison-Wesley, 1990, pp. 193-98. Nayak, P. Ranganath and John M. Ketteringham. Breakthroughs! Pfeiffer, 1994. Kahn, Aron. "Post-It Notes Popping Up Everywhere." Knight-Ridder/Tribune Business News, September 14, 1993. "3M Developing Electronic Post-it Notes." Computergram International, May 11, 1995, #2661. CAN YOU PLEASE GIVE ME THE FORMULA OF POLYMER ADHESIVE I WANT TO TEST IT EIGHTER IT IS WORKABLE OR NOT ?